The shops are filling with chocolate eggs and bunnies. Apparently it’s all to do with Easter – but what is Easter, and why do we celebrate events which happened nearly 2,000 years ago anyway ? 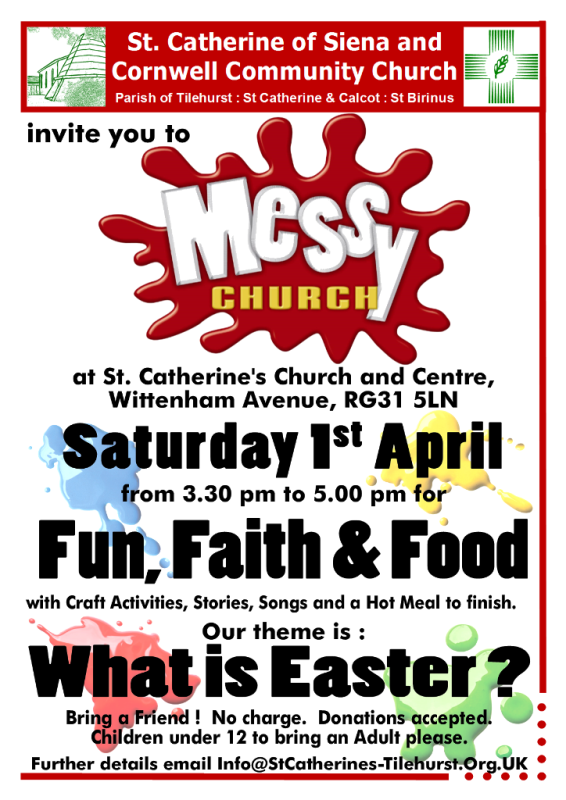 The first Saturday of the Month comes round early this time, so please join us on Saturday 1st April to explore “What is Easter ?”. As well as our normal mixture of Fun, Faith and Food, we’re delighted that we’ll be joined by our old friends from Word Puppets. We’re also giving you advanced notice of our special Family Service on Good Friday Morning – April 14th – at 10:30am. 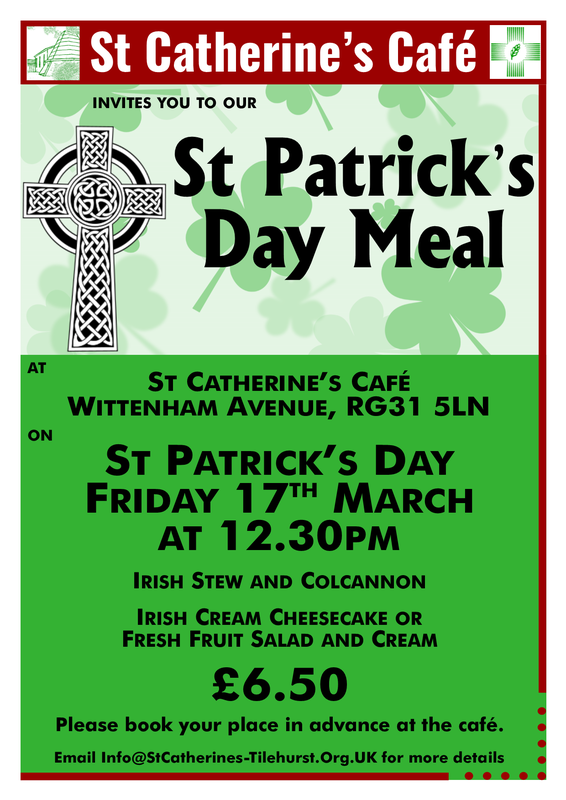 Please join us in the Café for our St Patrick’s Day Meal on Friday 17th at 12.30pm. We’ll be serving Irish Stew and Colcannon for the main meal, followed by your choice of Irish Cream Cheesecake or Fresh Fruit Salad, all for £6.50. Please book your place in the Café. You’ve hopefully all had your pancakes on Shrove Tuesday – but why ? What’s this ‘Lent’ thing about anyway ? 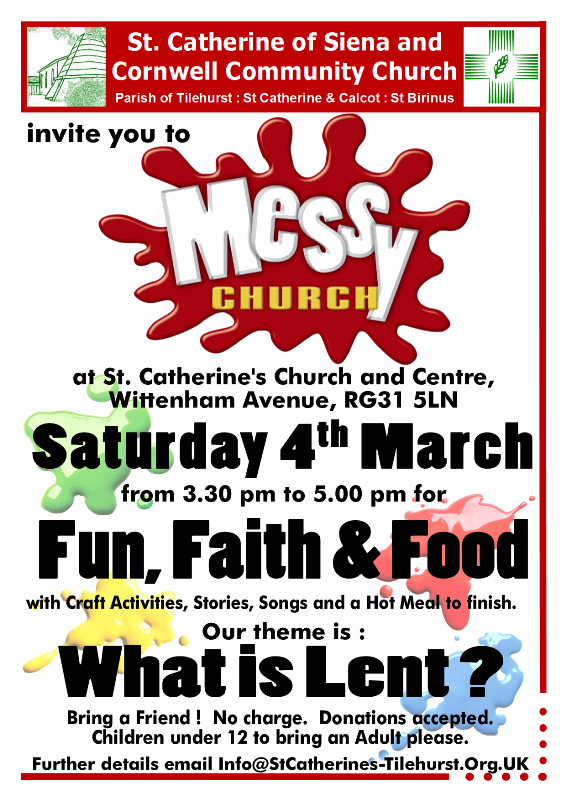 Please join us at Messy Church this coming Saturday – March 4th – to find out a little more about the church season of Lent through our normal mixture of Fun, Faith and Food. We’re also pleased to announce that we are able to put on more Messy Churches than shown on our original 2016/17 calendar. Please add Good Friday – April 14th and Half Term Saturday June 3rd to your diaries . We hope you can join us at St Catherine’s this coming Saturday March 4th at 3:30pm. Life’s more fun with family and friends so bring the whole family and invite a friend.